I CAN'T WAIT!!!!!! I'm so excited to see all of you again. Al's been teasing me all week about it. Mims, don't worry, I'll hook you up. I am crack dealer aren't I? 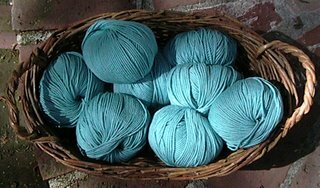 Arati, I meant to tell you a friend in Seattle asked for some of the wool cotton so I split the yarn up, I hope you don't mind, I made sure there was enough for a sweater for both of you. Kristin, I can't wait to see Amelia! Al and I are taking the red eye to Raleigh (doesn't that sound like a movie title?) so we will be getting there around 2 p.m. on Thursday. I'll email everyone my cell number. Also, I told the features crew at the N&O that I would have lunch with them on Friday, but I will be ready to go to Maryland after that. And it can be an early lunch, I don't think anything is set in stone. Did I forget anything? My memory lately has been awful. Sorry for not showing up to knit last night. I was and still am swamped with grading papers. I SO hate this part of my job. okay, i obviously can't do it the weekend of maryland, but i could probably do it that mid may saturday one. let me check with al, but let's do it!!!!!!! now vv, don't tease me! she has tons of workshops in portland. pick any one you want, i don't care what it is, if you're coming down for it i want to go! THIS IS IDENTICAL TO SSK IN RESULT, BUT THE STEPS ARE DONE IN ANOTHER ORDER. except i got this nugget of information off a website that seems to have some wiccan connection. but i'm going to look beyond that. oh my god!!!!! you know the odessa hat i'm having everyone here do? well it asked you to ssk and i thought i was doing that and one of the knitters was like, are you sure that's right? and i was like yeah i think, and then i looked it up on the internet and i'm so totally dead wrong. i've been doing the skp, or s1, k1, psso all this time. i think it will be okay on the hat because both stitches slant to the left, but what an IDIOT i am. i mean, jesus, its called slip, slip knit. you would have thought that it would have came to me at some point. if it seems like i've written the previous statement just after i finished figuring out that i'm wrong, that's because i did. I AM SUCH A DUMBASS!!!!!! what, no 'knitting for dogs' takers? dibs on: the all stitched up, mother of purl, dyer's garden, afghan squares, swift and sock yarn have been claimed. i should have done this earlier. my knitting corner is looking much more organized. 11 balls of the stuff i got on *sale*, (i use that term losely) it's the yarn i made the interweave knit's ballet wrap sweater out of. 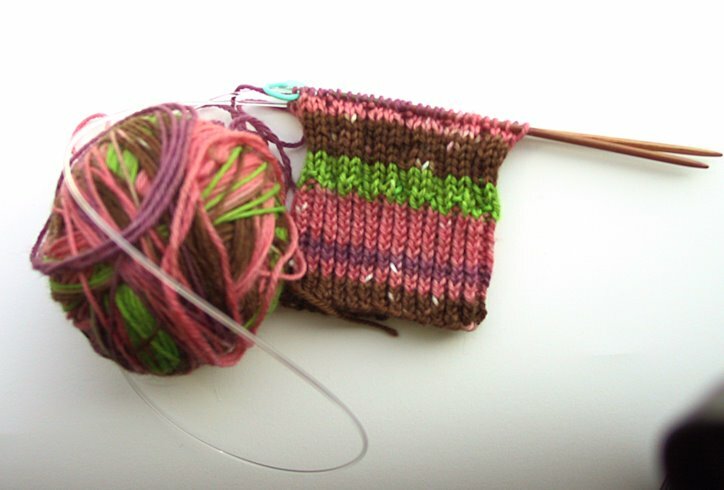 btw, this is how the self-striping sock yarn knits up. i meant to include it with the other picture, but i needed to actually knit it up. i think the next batch i'm going to do more even stripes, and try different colors. but besides a few white flecks (where i tied the strings too tight that the area didn't get dyed) i don't think its bad for a first-timer. vv, your sock yarn is absolutely BEAUTIFUL. (by the way, i typed "beautiful" in lower case and then highlighted it and hit apple k. it didn't work. why can't more things in my life work like quark? if my spinning wheel worked like quark i'd be so much better at it...) as for your hat yarn, silly me, i don't know if it would ever occur to me to use the yarn the pattern called for! god forbid, becuase then i might actually have a chance of getting gauge and could knit something without lots of math. why in the world are you getting rid of your swift? as for your books, i'd love to take "dyer's garden" and "100 afghan squares" off your hands. i'll eventually have the pound of white fleece spun and have the urge to make it different colors. and i've got a friend here who just got married in november and is about ready to start trying for a baby and i have dreams of me and the 2 other friends i've taught to knit making her an afghan. it might not be a bad idea for us to start knitting before she's pregnant if we're to have any chance of finishing before the baby arrives. as for my projects, i finally bought the last button for the olympic sweater, but i still haven't sewed it on. and i knit the baby's bib from mason dixon for joe's law school buddy and the baby's bib from one skein wonders for my high school buddy. one skein looks like a pretty good book. i don't have it, but i flipped through a co-worker's copy, the author is from portland so apparently we're eventually going to do a story about it. the bib is really cute, it looks like flower petals. the only downside is that there are a dozen ends to weave in that i haven't done yet. but if you're budgeting your yarn book buying, you've definitely got to go for mason dixon knitting. i haven't knit on the knit and tonic sweater in a couple weeks. i'm near the point where you seperate the sleeves from the body of the sweater and each round just takes so damn long i can't mentally handle it compared to the baby bibs and washcloths. speaking of washclothes, we've been using the one i knit and it's about time to get it clean-- wash it in the washing machine-- and i'm a tad bit nervous about it. i have visions of the spin cycle unraveling the whole damn thing. i've yet to put something i knit in the washing machine... and i'm still crocheting the damn blanket that's supposed to be a wedding gift for my friends. i'm maybe half way through and i'm so over it. i'm ready to go buy them a china place setting or something else that feels relatively lame/unpersonal to me becuase i'm sick of the blanket and afraid that i'm starting to put bad energy or something like that into it. so this is one of many projects i have going. this my friends, is self-striping sock yarn that i dyed. i'm so excited how it turned out. I purposely dyed more than i will need for one pair of socks, so if any of you are interested, its yours. i'll bring it along with all the other surprises. 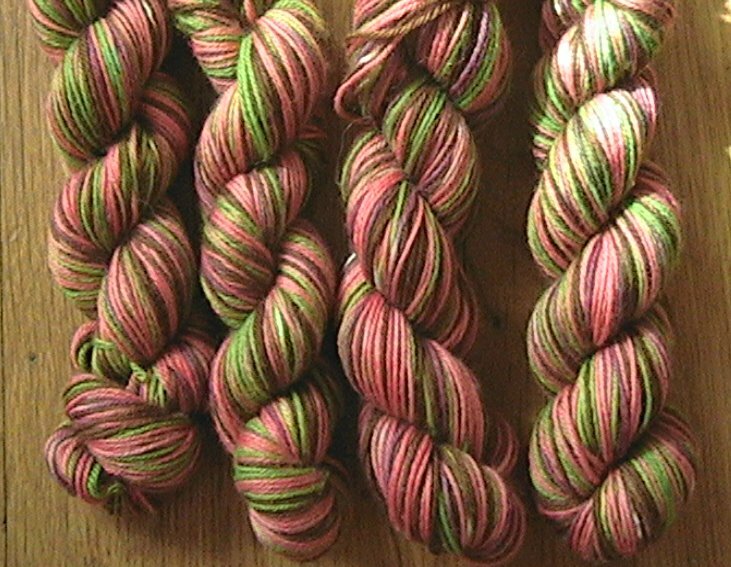 i'm going to dye some more in a different colorway, so if you don't like this color, you might like it. 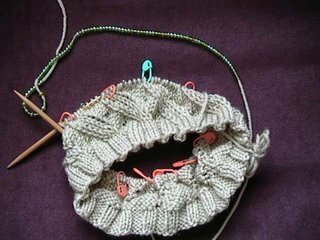 mims, to answer your question, the hat yarn is rowan cashsoft, just like the pattern calls for. 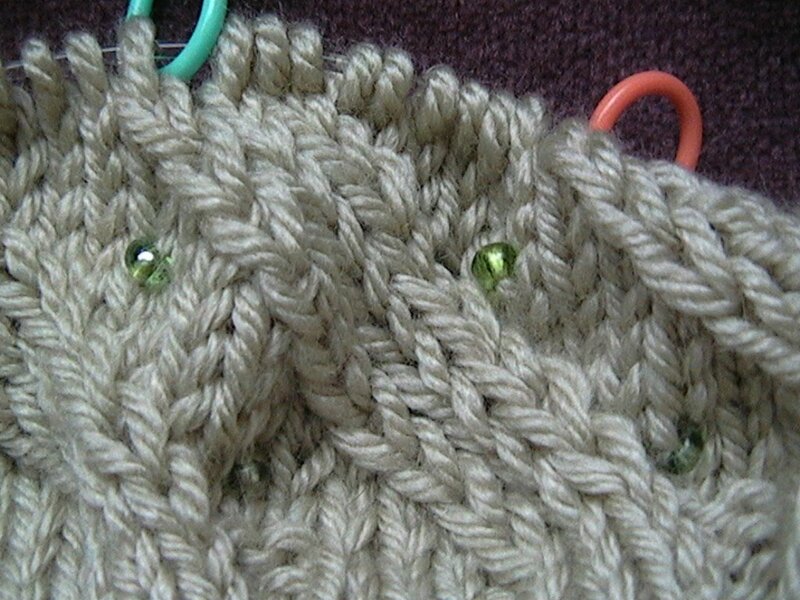 beverly, the beading is soooooo simple, you should totally knit something with beads. if you want, when we are in maryland, i can show you, but you can so figure it out on your own. also, in my spring cleaning mode, i've decided to eBay my swift. but if any of you want it, it's yours. if anyone wants any of these, just let me know, otherwise, to eBay they go. The weather has been a little weird, so I've learned you have to have a rain or shine policy about your activities. Al, Lilly and I went hiking this past Saturday to this little waterfall in the rain. The cold rain. But it was worth it. 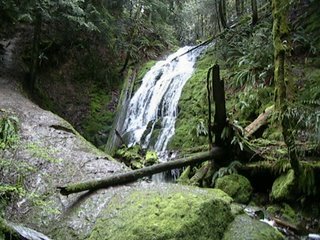 I think in the summer the waterfall would be dry, so I just keep telling myself that it was a good thing. Even though when we came back into Seattle, the sun was shining. (Talk about an EFFF you). I'm having fun with the beads. I don't know why I've never knitted with beads before, maybe I thought I'd be 'bedazzling' my projects. So I've been working on a few things, but I never can seem to get the photos to go in the order that I want them to, so I'll talk about each item separately. First, Sundara Yarn. 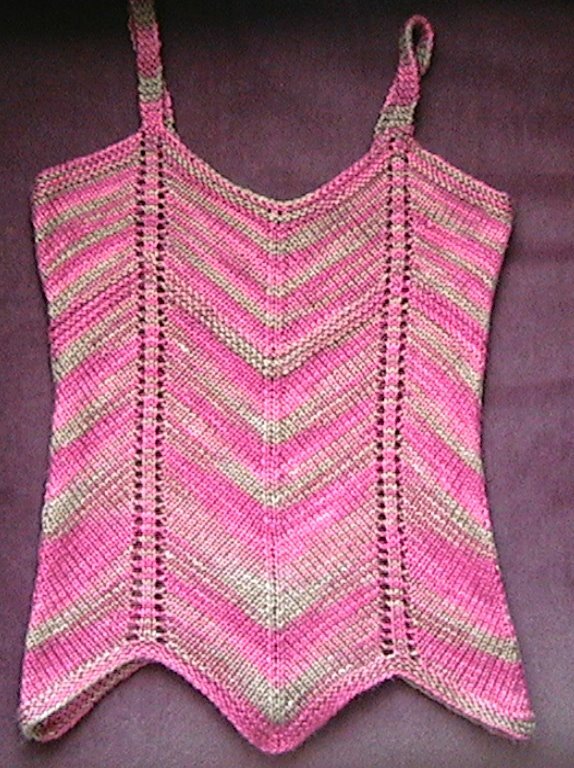 She's amazing, her yarn is amazing and thus, I have an amazing tank top. 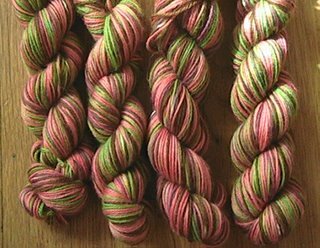 and you get a skein of Sundara Yarn, and you get a skein of Sundara Yarn, and you get a skein of Sundara Yarn, and you get a skein of Sundara Yarn, and you get a skein of Sundara Yarn!!!!!!!!! So have some projects in mind, 'cause when I get to Raleigh, you'll have some beautiful yarn coming to you. It's not the same color as my tank, but it will be gorgeous. I came back to visit. Sorry for being such a slacker. 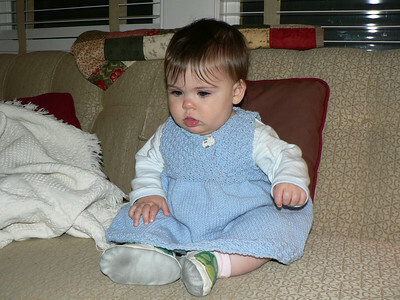 Here's a picture of the dress I knitted for Amelia. I'm about to head over to a knitting meetup in Nash Square, organized by Marcy. I guess there will be a bunch of random N&O crafters. Hopefully, no bums will accost us and no rats will run over our feet. Beverly, Arati and I got together to knit on Wednesday, and Beverly said something that I keep thinking about. She said she always brings sweaters, rather than shawls, to knit on Wednesdays because she's afraid I'll judge her for knitting more shawls. Am I that harsh? I guess I'm such a goal-oriented person that I feel I should be finishing up useful things all the time, not just knitting things because I enjoy knitting them. I'm gradually realizing that's ridiculous. Because half (or more) of the stuff I knit for myself, thinking it will become a staple of my wardrobe, I never really wear. The fact is, it's hard to knit nice clothes that don't look like something you pulled out of the seconds bin at an outlet mall. 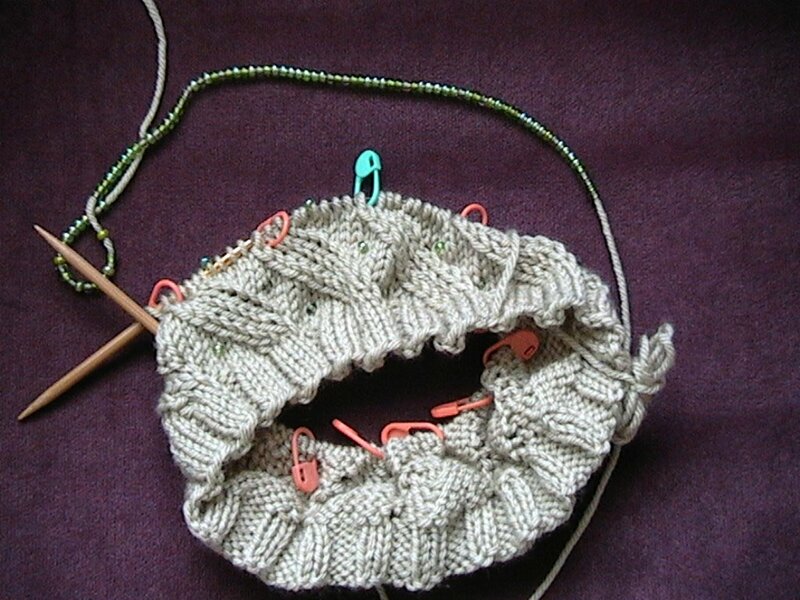 So why not just knit whatever is fun to knit, and if you end up using it, all the better. If not, who cares? Beverly, if you want to knit nothing but shawls until the end of time, that's fine. And if they are beautiful, but you never weave in the ends and block them and you never use them, well, I don't understand it, but it's fine. Really. 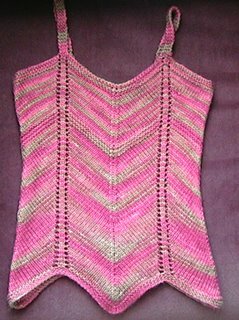 And I'll just keep on with my illusion that the next sweater/tank top I knit is going to be the most perfect and practical garment ever. VV, keep us updated on your job situation. I swept the NCAA pools at work. Which means my fiber budget for Maryland just got a lot bigger!!!!! i haven't decided what i'm going to do. the jist is the arbitration decision has to be made by april 2007. if the times wins, then the paper's closing could take place as soon as 6 months after that or as late as a year after that. right now, i've decided to just keep beefing up my portfolio, maybe get in touch with the times, possibly the other papers in the puget sound area, or maybe elsewhere. i really haven't started to panic. i just feel like enjoying the summer here before i do any real panicing. on the upside, there are two ncaa pools going on in the newsroom here, and as of right now, I won one, and if florida wins, i will win the other one also. (can we say fiber budget? i'm on pace to win about $200) so GO GATORS!!!!!!! also baseball has started, so i pretty excited about that. (i have my cubs shirt on today, and tomorrow the mariner's tee comes out, as do i, to SAFECO field. and i'm almost finished with the eyelet wrap i want to wear in maryland. i'm just knitting the ties right now. mims, i wouldn't mind if you got that freelance info for me, if nothing else, it sounds like fun. i really appreciate it. so that's the update, i'll post a picture after i finish the sweater. First of all - damn VV. Don't suppose you'd give any thought to coming back here - to the place where you're loved and adored? Just keep us posted. Mims - I'm getting ready to start on the same cardigan! I'm making it for Alex. She picked out the yarn. She actually couldn't have the color she wanted most - which was a dark brown - but she decided on a lime green. I'm using Jaegar "Trinity" which I've been wanting to knit with for at least a year. It's got the same gauge, and similar composition so I'm excited. Haven't gotten started yet though. Should be able to tonight though. Keep me posted on your progress. About the knitting bags. Being the bag whore that I am. I have a couple that I actually haven't started using yet. I just can't say no to a bag! The one I'm obsessing over right now is the Lexie Barnes "Lady B" bag in the design "Little Miss Perfect". I just love it! It's the cost that's keeping me from buying it this very day. I definitely plan on buying it though. VV, keep us posted on the job front. Mims - keep me posted on the cardigan.